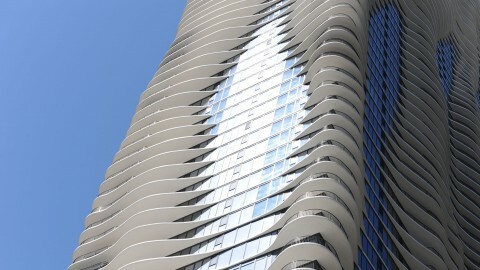 From the moment it appeared on the Chicago skyline, the Aqua Tower has earned numerous awards for design excellence. However, it hasn’t kept all the glory for itself. 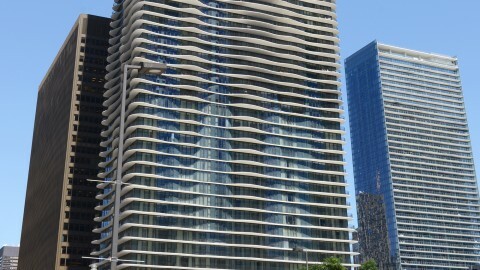 It’s fair to say Aqua is a star-maker, with its 2009 completion putting the city’s newest neighborhood, Lakeshore East, on the tip of everyone’s tongue. 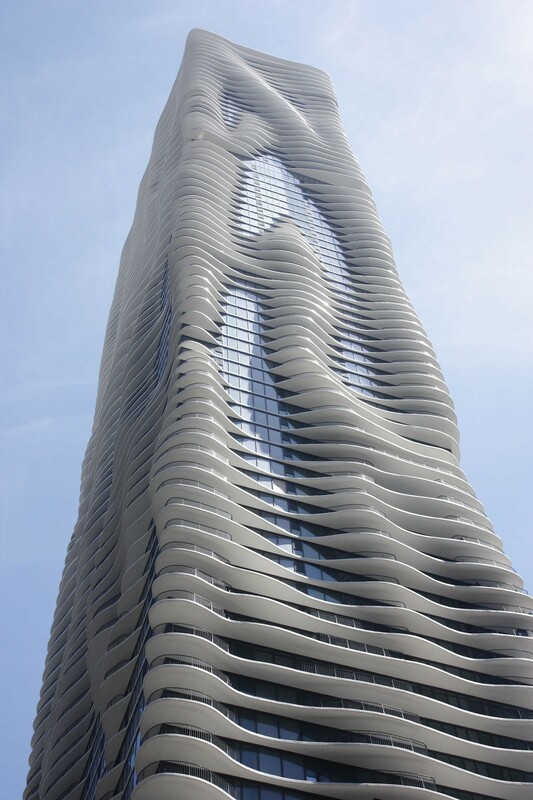 And though Aqua certainly wasn’t architect Jeanne Gang’s first project, it is the one that put her on Chicagoans' architectural radar. From a distance you notice the texture of the undulating balconies (or waves) and the ‘pools’ of reflective glass that do look like water. 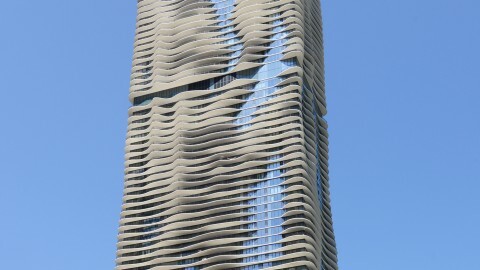 But Aqua is unique among skyscrapers because the best view is close-up, just across the street, looking up at those concrete balconies that appear soft, like marshmallow outcroppings. Studio Gang broke the mold with this design, without breaking the bank with its construction costs. 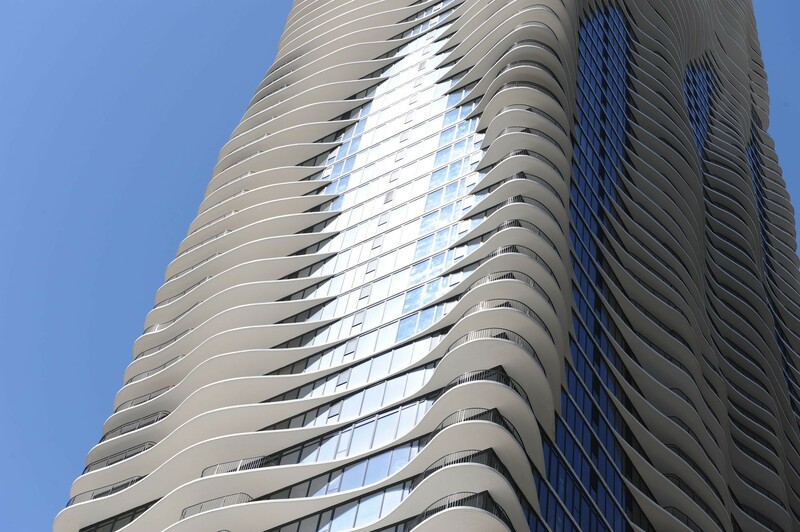 The Aqua Tower’s design is a brilliant new approach to the problem long ago identified by Louis Sullivan—how to create an aesthetic for a functional tall building. The basic structure is a standard, modern box. 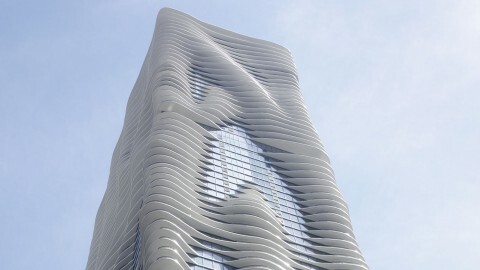 But Jeanne Gang and her firm, Studio Gang, surrounded this box with slow-rippling, white concrete balconies, giving the skyscraper a sculptural quality. Each individual balcony is unique in size, shape and protrusion, allowing residents to chat with neighbors above or below. The balconies also help to break up wind vortices, minimize wind shear, shade neighboring apartments and prevent birds from colliding with windows. Each balcony is part of a greater floor slab. Contractors used GPS coordinates to precisely pour each of the 82 designs. Building Aqua was a feat of engineering. Those not staying in Aqua’s Radisson Hotel (floors 1 through 18) or living in the residential units (floors 18 through 81) can experience the building’s majesty, even from afar. The curving white concrete balconies and colored glass create the impression of water cascading down the building's sides. 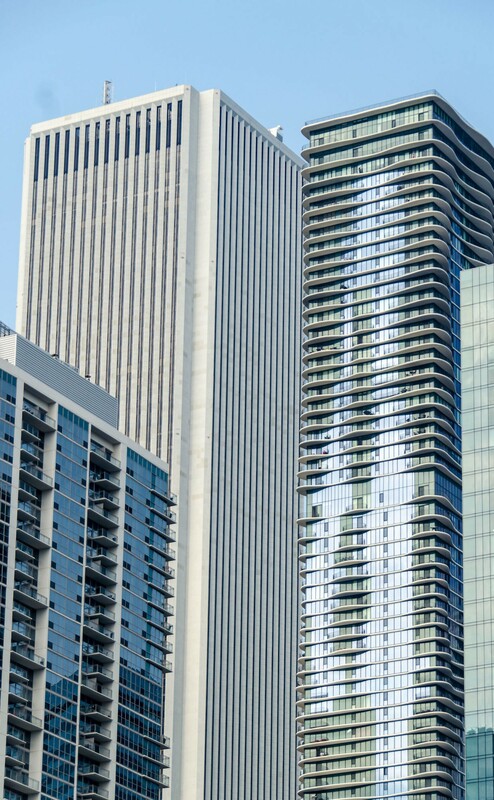 The wave-shaped balconies are arranged so each unit has a view of at least one of these six sites: Oak Street Beach, Navy Pier, Cloud Gate in Millennium Park, the Lake Street "L" tracks, the park in Lakeshore East or Buckingham Fountain in Grant Park. 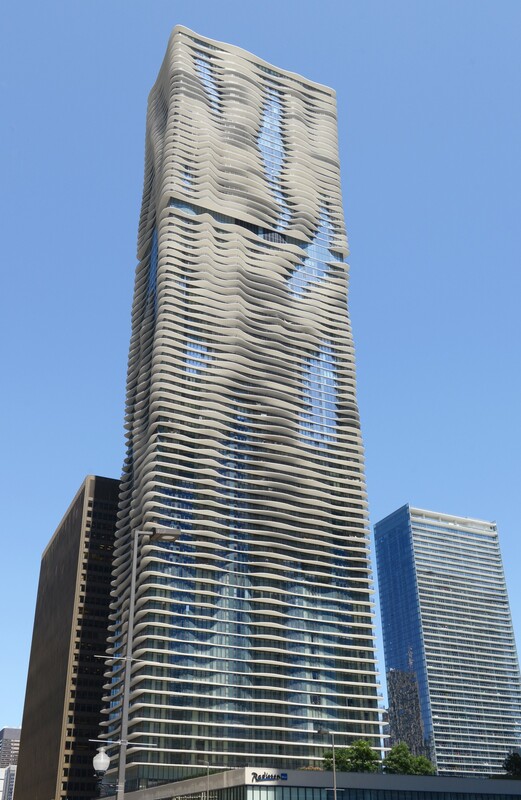 Aqua is the tallest building in the United States designed by a woman-owned firm. Gang notes that her inspiration for the white concrete comes from limestone, which makes up prominent natural formations in the Midwest United States. At a dinner following a Frank Gehry lecture, Jeanne Gang happened to be seated next to a developer of Lakeshore East who had a site remaining. 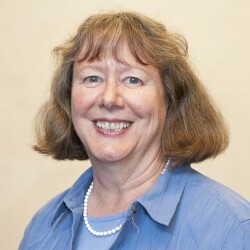 She impressed the developer and thus she was hired for her first skyscraper -- almost by accident. 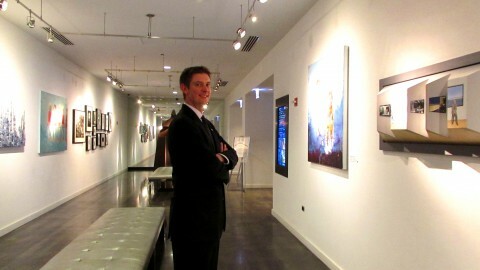 Aqua’s neighborhood, Lakeshore East, is Chicago's largest urban infill development. 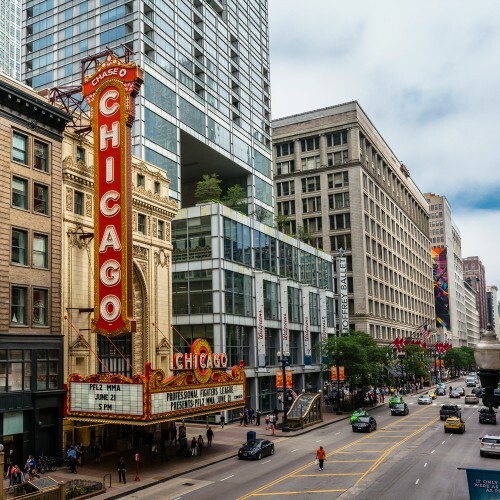 It covers a major segment of land southeast of Columbus and Wacker Drives and was developed by Magellan Development Group LLC (Loewenberg & Carlins). 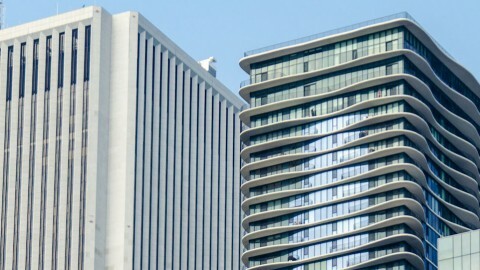 Situated next to Lake Michigan in Lakeshore East, the building’s water motif connects residents and visitors to the city’s most remarkable natural landform. 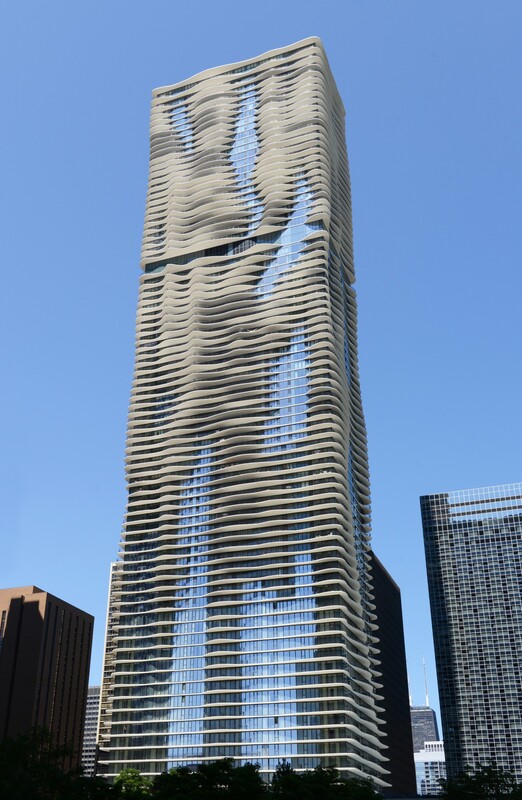 Also paying homage to the Midwest’s natural beauty is Gang’s decision to make the Aqua Tower planet-friendly, through rainwater collection systems, heat resistant and fritted glass, and energy-efficient lighting. 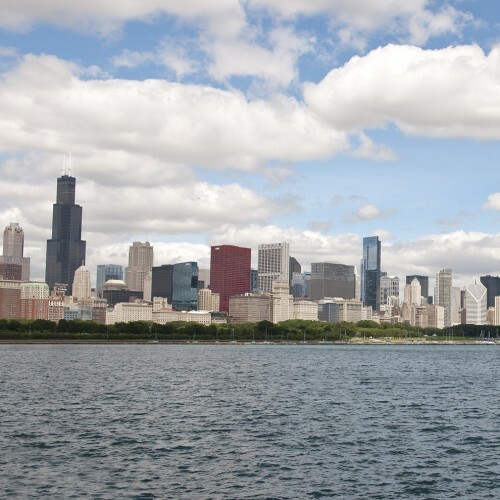 Learn about Chicago's world class architecture from real Chicagoans. Our tours let you explore the city and its architecture in a new way—by land and water.